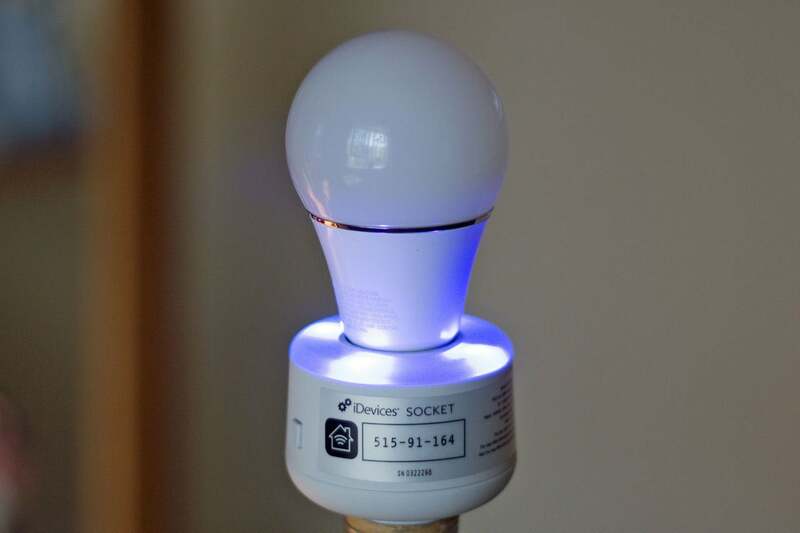 An effective light bulb on, off, and dimmer control, with a neat variable-hue nightlight. The iDevices Socket retrofits a regular light socket to make it smarter. It has built-in color-controllable LED ring to communicate status during setup, which acts as a nightlight or accent light at other times. The fixture turns on an off an incandescent, LED, CFL, or halogen bulb of no more than 60 watts or the equivalent. If the bulb is dimmable, the Socket can control lighting intensity, too. The protruding portion of the device is about 2 inches tall, limiting it to a lamp with a harp that’s 8.5 inches or taller, or a harp-free lamp in which the bulb won’t peek out the top or under a shade without causing aesthetic issues or casting light where you don’t want it. You set up a Socket with the free iDevices Connected app, which is available for Android and iOS smartphones and tablets (this review was conducted using the latter). The Socket is compatible with Apple’s HomeKit smart-home technology, which allows one or more Sockets to be controlled via the Home app and by Siri voice commands. It can be managed remotely via a HomeKit-enabled Apple TV or iPad. The Socket can also be controlled with voice commands via Amazon’s Alexa (Amazon Echo) and Google’s Assistant (Google Home). 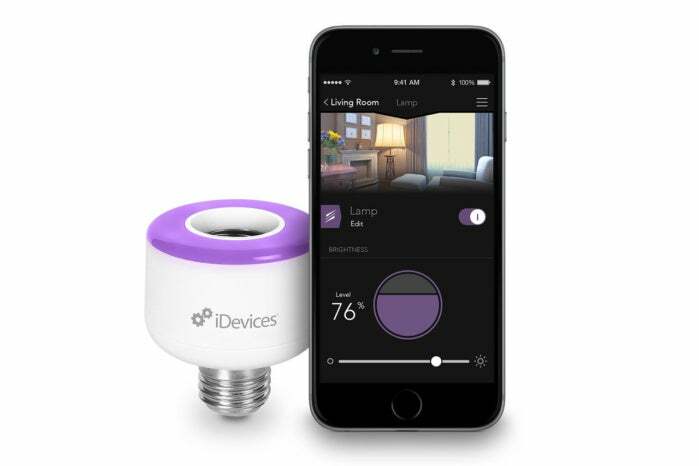 The iDevices Socket has a built-in variable-color nightlight. Set up should be easy, but I had trouble with the Socket I was sent. It wouldn’t set up initially, and I followed instructions to put it back in pairing mode, which failed. I then used the reset instructions, also simple, and tried to pair, which worked, but didn’t complete. After a few more tries, I got the Socket connected to the Wi-Fi network and paired in HomeKit. In iOS, HomeKit “sees” the Socket as two separate devices, but because of the limited space in how the Home app shows assigned rooms and device names, you’ll need to customize each Socket appearance so you can tell the difference between the bulb control and the LED ring. 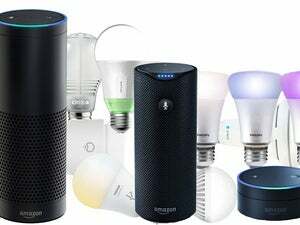 It’s impossible to not compare the Socket with the line of Philips Hue bulbs and other lighting products, which was early to market and dominates the connected-home lighting market. Hue requires a hub, which a Socket doesn’t—it connects directly to a Wi-Fi network. Hue bulbs include both the lighting source and a ZigBee radio, enabling them to fit into many more lamps than a Socket. And Philips offers both dimmable white and white/color bulbs, which can double as nightlights at low intensities and soothing colors. Hue bulbs can also sync lighting to music. You can set the hue, saturation, and brightness of the ring through the iDevices app. The Socket’s LED color ring is the real defining characteristic and differentiation, since Philips can only do light and color at the same time in a single bulb. 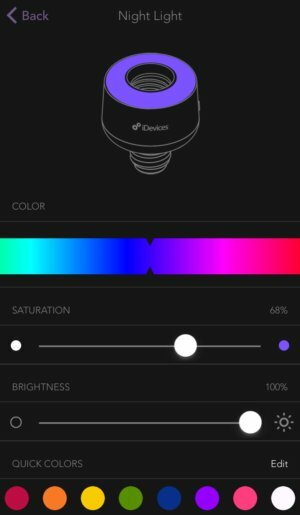 The Socket ring allows you to set hue, saturation, and brightness, and select from a few preset colors, but there’s no option to associate colors with a schedule or set up color cycling or patterns. For two or three appropriate-sized lamps, a Socket could wind up costing less and working better for your purposes. Hue bulbs are typically sold in bundles, some with a hub, which reduces the cost for larger installations. Both Hue bulbs and the Socket fixture, however, are limited to the equivalent of 60 watts, which is too dim for many purposes. Some of us might read with a 60-watt bulb in a lamp positioned to cast light onto what we’re doing, but that low an illumination is usually for ambient lighting, making it less useful for general purposes and automation. A stylish way to control, dim, and accent a lamp without switching to a smart bulb.